Carburetors can be pretty tricky devices. With that in mind, try to focus on only one set of adjustments at a time. If you go adjusting things without any predefined plan, it is very easy to get very out of whack! It is always a good idea to take notes on the changes to settings that you make (how many turns to closed is a good item to note) as you change them so you can get the carburetor back to the condition it was in before you started adjusting things. 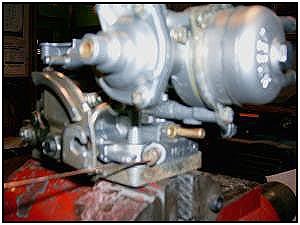 First, always adjust the lean best idle with the idle speed screw backed off so it is NOT touching the linkage. Two, when setting the idle mixture screw, only adjust it for the best and smoothest idle. Here's the trick: if your idle mixture screw is out more than 1.5 turns at this point, you need a bigger jet . The primary idle jet is located behind the choke housing on the side of the carb under a very large slotted brass screw. Most of these Webers have a 50, 55, or 60 idle jet . A well set Sami engine will stand a 60 or so idle jet, some highly modified ones will take up to a 75 (max size). Once the correct idle jet is installed, you should notice that the idle speed screw is very sensitive and will bring the idle up fast. This is because the idle jet is controlling the amount of available fuel VOLUME to the transition circuits. These circuits are what make drivability just off idle clear up to 2k or so. If you ever try to adjust the speed screw and run into a flat spot, either the idle jet is plugged or the jet is too small. Jetting a carburetor can be a tricky bit of business. The jet sizes below are in the "ballpark" for the typical 1.3 Samurai. However, things like the amount of compression an engine has (either through wear or performance mods), high altitude operation and engine timing can effect any carburetor's performance -- including a Weber. Thus, the condition or setup of your engine may require a change in jet sizes from those suggested here. The jets on top are the air corrector jets for the main circuits, one for each respective barrel. It should have a 160 primary, and 170 secondary air jets. Be aware that the air corrector jets will adjust the amount of air VOLUME available to be mixed in with the main fuel circuits at the upper range of each barrel. For example, if you find that you have to constantly keep opening up the secondary to maintain highway speed, try dropping down one size air corrector on the primary side to richen up the mix for a bit more power. If it gets worse, go up one size to lean that range out a bit. If at the point of opening the secondary there is a hesitation or balking, the secondary idle jet needs to be larger. Down in the bottom of the fuel bowl is the main fuel jets, most use 135-140 range for stock engines and 140-142 for modified motors. Most use a 50, but could use a 55 or so. I usually try to stay within 10 points of the primary idle jet size, good point of reference to what the engine will use. 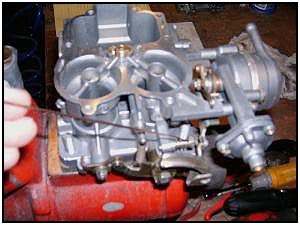 Once properly set, the carb should seriously roar when the secondary is opened as you are feeding a lot of air at once. Open air cleaners will make it louder, so will 2" exhaust. BTW, unless you can figure out a way to jam more air/fuel into a Sami engine than I can, don't ruin that motor with an exhaust any larger than 2", and run it the full length of the vehicle to get the best powerband and torque you can extract from it. A good flowing /medium back pressure muffler works well, cherry bombs won't help anything especially your ears . Pumps like the Walbro and Facet may be difficult to mount as they may feed from the top. The best position is as low and as near to the tank as you can. A Holley #12-804 regulator (or similar zero to five pound regulator) could be added as well on the passenger side fender. Be sure to disconnect the fuel return system and remove the stock fuel pump along with the camshaft-driven steel pushrod that drives the pump. Bad things can happen if you leave that rod in place and install a blocking plate! Speaking of blocking plates, a small block Chevy fuel pump blockoff plate will work with a little modification.